Skills development is a lifelong process. And what are European Union policy actions regarding digital skills? 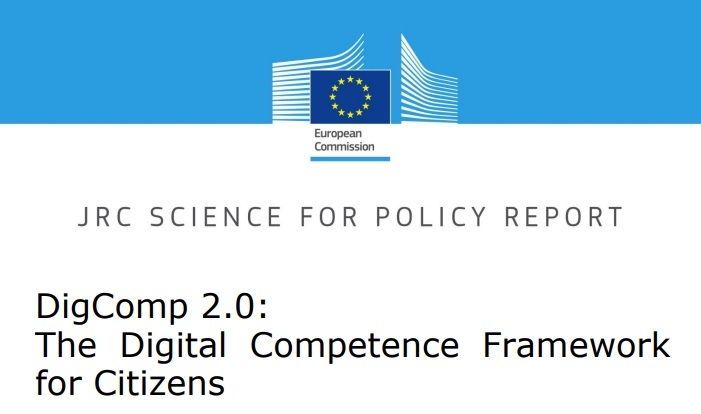 DigComp 2.0 was completed with the publication of DigComp 2.0: The Digital Competence Framework for Citizens. Update Phase 1: the Conceptual Reference Model. The update consists of a revision of the 21 descriptors and the vocabulary, both of which are listed below. Phase 2 of the update, which will be completed by the first quarter of 2017, includes 8 levels of learning outcomes and examples of the knowledge, skills and attitudes related to each competence. For the involvement in the validation process, contact the team. To articulate information needs, to locate and retrieve digital data, information and content. To judge the relevance of the source and its content. To store, manage, and organise digital data, information and content. To interact, communicate and collaborate through digital technologies while being aware of cultural and generational diversity. To participate in society through public and private digital services and participatory citizenship. To manage one’s digital identity and reputation. To create and edit digital content To improve and integrate information and content into an existing body of knowledge while understanding how copyright and licences are to be applied. To know how to give understandable instructions for a computer system. To protect devices, content, personal data and privacy in digital environments. To protect physical and psychological health, and to be aware of digital technologies for social well-being and social inclusion. To be aware of the environmental impact of digital technologies and their use. To identify needs and problems, and to resolve conceptual problems and problem situations in digital environments. To use digital tools to innovate processes and products. To keep up-to-date with the digital evolution. In 2016, over 200 projects applied to Digital Skills Award 2016 from all over Europe. Sixteen projects were selected as finalists and the fourmost outstanding ones were announced in Brussels on 1 December 2016 at the launch of the Digital Skills and Jobs Coalition to develop a large digital talent pool and ensure that individuals and the labour force in Europe are equipped with adequate digital skills. All organisations who take action to boost digital skills in Europe can become members of the Coalition by endorsing the objectives and principles of the Coalition as laid out in the members Charter. They can also pledge to take action to carry out initiatives to tackle the digital skills gap. The primary purposes of DigCompOrg framework are (i) to encourage self-reflection and self-assessment within educational organisations as they progressively deepen their engagement with digital learning and pedagogies (ii) to enable policy makers to design, implement and evaluate policy interventions for the integration and effective use of digital learning technologies. # The European Commission’s Opening up Education initiative emphasises the need for educational institutions to review their strategies in order to integrate digital technologies in their teaching, learning and organisational practices. Results of the regression analysis show that the level of digital competence is an important predictor for enrolment in MOOCs and that specifically interaction skills are the most important factor for participating in the MOOC context. By providing support to a unique mix of high-risk, long-term, multidisciplinary and collaborative frontier research projects, the Future & Emerging Technologies (FET) programme continuously pushes technological boundaries into unexplored territories ... This booklet is intended to give just an idea of the rich range of FET projects.